In small bowl, stir together Lemon-Herb Aioli ingredients. Cover with plastic wrap; refrigerate until ready to serve. Gather 3 wide, shallow dishes. In first dish, stir together flour, dash salt, dash pepper and dash paprika. In second dish, beat egg, milk and hot sauce with whisk. In last dish, stir together bread crumbs, dash salt, dash pepper and dash paprika. 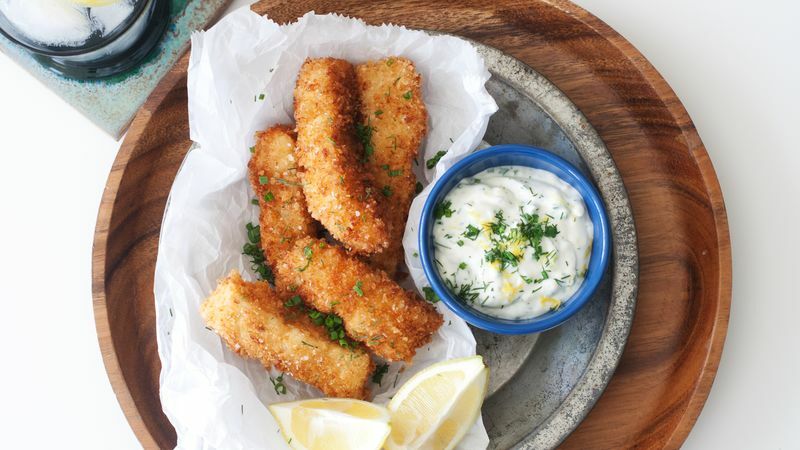 Coat fish sticks with seasoned flour, dip into egg mixture to coat, and then bread crumb mixture, pressing bread crumbs into fish if needed. Place on plate; repeat with remaining fish until all are coated. Heat 10-inch cast-iron or nonstick skillet over medium-high heat. Fill skillet with 1/4 to 1/2 inch of oil (enough to reach halfway up sides of fish pieces). Once oil is hot, fry fish sticks in batches, a few minutes on each side, until golden brown, crisp and fish feels firm. Drain on paper towel-lined plate. Repeat with remaining fish. Serve with aioli and if desired, lemon wedges. You can mix together the aioli up to a day ahead. The flavors will marry together and mellow as it sits in the fridge. Dredging the fish first in flour, then egg, then bread crumbs, assures an even, crispy coating. The fish will only take a few minutes to fry each side, so preparing all of the pieces of fish ahead of time, instead of coating and frying as you go, makes for much quicker (and less messy) cooking.